There’s no need to restrict planting to the ground. From the smallest house to the biggest development, bringing the walls to life can have surprising benefits The urban green revolution is all around us. From floriferous balconies to lush roof gardens, green walls and innovative urban food-growing schemes, the plant-love in our cities continues to grow. And rightly so. Every tiny patch of planting brings a benefit to those who live and work there. A challenging world of flash floods and unforgiving, heat-baked concrete is transformed by foliage-dappled sunlight and fresh scents. Through a host of small utopias, cities can become an ever-changing palimpsest of greenery. The evidence is overwhelming. Vegetation in cities helps regulate air temperature and combats air pollution by trapping particles on leaves. It also reduces local flooding by absorbing rainwater, both at root level and by holding it in the canopy of foliage, while planted areas are known to increase local biodiversity. On a domestic level, few need convincing but, if the warm glow of environmental rectitude is not enough, there are also good business reasons to seek out an urban greening specialist. Foliage on or around a building acts as an insulating jacket which keeps the building warmer in winter and cooler in summer. This not only reduces carbon emissions but saves on heating and air-conditioning bills. There are also human benefits, such as improved mental health and reduced stress. “You will get things from a green building that you won’t get from a conventional green space,” says Gary Grant of the Green Roof Consultancy, who designed London’s largest green wall, at the Rubens Hotel in Victoria, London <video > “It is better for the people using it and the building is more attractive so, for example, if it is next to a restaurant, then you get a busier restaurant. 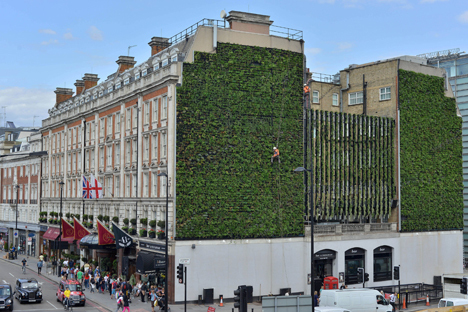 Towering six stories over the busy street below and covering an area of 350 square metres, the living wall at the Rubens contains more than 10,000 plants from 23 species, including evergreen ferns, ivy and flowering plants such as geraniums, crocuses, buttercups and strawberries. Installed and maintained by expert urban greening company Treebox, the wall is checked at least four times a year. In the meantime, a rainwater-collection system on the roof, text-alarmed in case of failure, stores up to 1,200 litres of water to irrigate the planting modules. Designed to create drifts of color throughout the year and provide forage for pollinators, the vertical garden imbues a once featureless façade with charm and personality.